Ed. note: Andrea, Bringer of Happiness and Provider of Sexytimes, has taken over the narrative for this post. Enjoy. I was entrusted a few months ago with the weighty task of attending Tom McCarthy’s reading at McNally Jackson Books (had my delinquency in writing this post been known at the time, I am not sure I would have been given this opportunity). I’d been to one prior reading at this venue and found it to be civilized enough to provide a relaxed setting for a reading. However, The Insulted had advised me to turn away if it looked like Mr. McCarthy’s audience looked like a rowdy pack. Quite the contrary – things were very orderly and although all of the seats were soon filled, everyone was polite. Per instructions received, I sat at the front right corner so as to be well-positioned for the reading. I felt like a bit of a fraud – I had no clue as to what his new book was about, nor did I know anything about the author himself and his oeuvre. The audience was quite diverse, so that didn’t give me any sense of what I was about to hear. I sat next to some tittering British art school students. There were also some journalistic types taking notes throughout the reading. Mixed within the rows behind me there seemed to be a number of graduate students; probably of literature, English or otherwise, judging from their “look-what-I-know” comments that often involved citing obscure information about other authors during the Q & A portion. Mr. McCarthy easily and fluidly engaged in these brief discussions without any trace of affectation. He was and is genuinely interested in and knowledgeable about the sources of the literary, historical and cultural references he makes in his own writing. I was delighted and struck by the amount of research that went into C. During the Q & A, Mr. McCarthy described vividly his visit to a radio museum and being permitted to go through their archives while researching for his book. Owing in part to the fact that my father is a scientist, I have a deep appreciation for and interest in in-depth analyses of obscure historical minutiae, art-related or otherwise. So, I was pleasantly surprised to have been sent to this reading in particular (especially as The Insulted lamented to me via text how unhappy he was at the Jonathan Safran Foer reading at that moment). Mr. McCarthy spoke and dexterously interspersed his answers to audience questions with references to Pynchon, Beckett, Joyce and other famously humbling authors. I kept thinking how refreshing it was to hear someone who thoroughly enjoyed and related to these difficult sources. There was no pretension in the very easy manner in which he mentioned authors, conceptual artists (another pleasant surprise for me! ), and certain texts and how they influenced or related to his own work. He was very humble and gracious, perhaps aware of how pretentious his references could sound with the wrong presentation. As the area of the bookstore in which the reading took place was a bit cramped, there was some shuffling of table and chairs during the transition from reading to signing. Mr. McCarthy kindly helped the staff move things around. As I was first in a not too unruly signing line, the momentum that builds as an author signs “to” each new person had not yet developed. I felt I had a moment to request an insult addressed to Bill and to explain the premise (and I had to do a good job of it, as it was on The Insulted’s behalf). 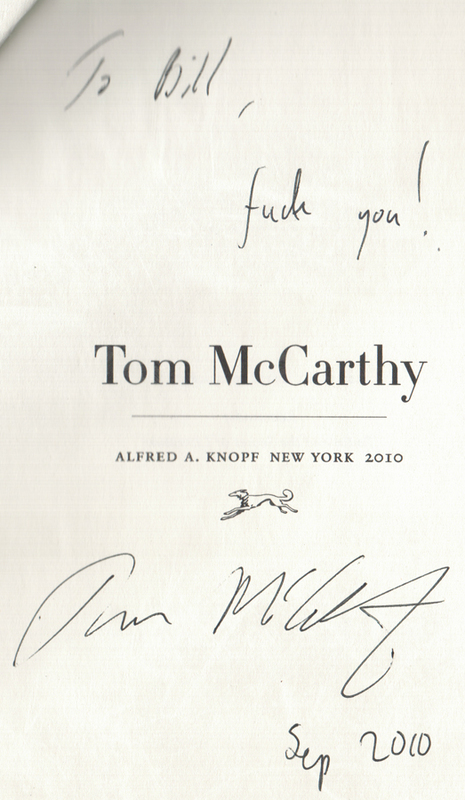 Mr. McCarthy paused for a moment, smiled and wrote out his aspersion. He commented that is was very nice of me to have attended that evening for Bill (I did not let on as to the reason Bill couldn’t be there). He was very warm and appreciative of his audience and thanked me for coming. I hope he is a professor somewhere, as he would make a great teacher; his humility and appreciation for his literary and audience subjects were infectious. Wish I was there with you, Andrea. Nice job! Agreed. She’s now contractually obligated to post six (6) more AND make me breakfast in bed. Next time, read the fine print, Baby!